There are so many Haitian music award these days that the Haitian music artists are not taking them seriously... It's as if everyone says to themselves, "Ban m fé yon Haitian Music Awards tou." Read this article by Jean Robert Noel. In any formal music industry, an annual "Music Awards" ceremony is held to honor artists for their achievements in the music world. Certain parameters are taken into account for an artist or a musical group to be nominated and to have the possibility of winning an "Award". Nominations are based on the quantity of records sold during the year, the frequency of the broadcast of an artist's or group's works over the air, the turnover of a group / artist, the activities related to the artist on social networks, the number of visitors to video sites of an artist or musical formation and the vote of the general public. These are the parameters that global awards organizations value. In the Haitian community of the United States, a Haitian Music Awards ceremony is held each month, regardless of the prerequisites for appointment. We had an awards ceremony in December 2017, a second in January 2018, another in February and the most recent in March. It is certain that another will be organized in April 2018 and it will not be the last. It must be said that none of these organizers can declare the exact number of records sold by each musical group. Moreover, Haitian record stores have never used a bar code scanner to help in this direction. No musical group is able to specify the frequency of broadcasting their music over the air or the number of discs sold, or even those award organizers who are not knowledgeable in the field. The idea of hosting a Haitian Music Awards ceremony is good, but the frequency with which these events are organized does not reflect the spirit of recognition of artistic values. We arrive at a time when everyone is trying to offer such a ceremony. They are titled with all the names: "Glorious Haitian Music Awards", "Best Haitian Music Awards", "HMI Music Awards", etc. Not surprising to see names like: "Karavan Haitian Music Awards", "Tripotay Haitian Music Awards", "PetroCaribe Haitian Music Awards", "Ka Madan Bruno Haitian Music Awards", "Ti sourit Haitian Music Awards", etc. . It's as if everyone says to themselves, "Ban m fé yon Haitian Music Awards tou". None of these award organizers receive a tax exemption (tax exemption in English). They are obliged to fix admission fees. So, it's a for-profit activity. From such a logical analysis, it can be said that it is a matter of personal interests. 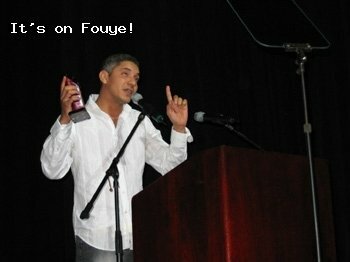 Would not it be more interesting if these concerned unite to present a single Haitian Music Awards ceremony per year? They can, if they wish, present the event in a different city each edition. In general, in the regulated music industries, well-known organizations and personalities are responsible for such a cultural event. With all these "Haitian Music Awards", we are lost, we are caught in a labyrinth. Organizers of "Haitian Music Awards" cut the grass under the feet of close collaborators and also their competitors. We realize that hate, jealousy and hypocrisy dominate the music and entertainment sector. One could only imagine the day before or two days before a Haitian Music Awards ceremony that members of another organization call the leaders of the amphitheater, where the ceremony would take place , to tell them that members of a gang will come to break the chairs, the windows of the room to create a situation of tension and violence in the enclosure. Taken in fear, the people in charge of the venue had to report such a fact to the authorities concerned. And, they then announced to the organizers of the Haitian Music Awards night that they will no longer be able to use their space to present their ceremony. On two occasions, the cancellation of the event was announced one day before the date of the presentation. In one case, a Miami radio host was accused. In another, a lady who was also boycotted was singled out for her scheduled Haitian Music Awards night. What satisfaction can someone have in such a practice? On other occasions, through the public rumor or the Arab telephone (Teledyòl), they circulate news suggesting that the award ceremony will not take place. It's incredible. Ka nou grav! A collaborator had to leave her associates to go to create a personal association of awarding of prizes, in order to organize her own ceremony of "Haitian Music Awards". She used the same title as her former membership. She also named it "PHMA". This automatically proves that the original association it comes from is not legally registered, nor does it use the one it uses. Otherwise, this first organization would sue the person using the name. Moreover, in the United States, when you register the name of an organization, the Commerce Department ensures that the same name is not already used by another entity in the same city. It can be said that none of these Haitian Music Awards ceremonies had met the expectations of the organizers and the public that made the trip. Faced with such situations, musicians will not take any of these organizations seriously. A musician had personally told me that his band would not show up for any of these fakes if he did not receive a stamp from the organizers, since, he says, they earn money at the expense of the musicians. This is the form of thought of a musician who does not value the gesture of honor! This may negatively affect such ceremonies in the future. All this tumult shows that the Haitian music industry works in the image of the country. One would tend to say that there are as many Haitian Music Awards organizations as there are Haitian political parties. After such failures, these award managers should have thought of other strategies to regain public confidence. They already make an appointment for 2019. What is the source of funding for these entities, since they have no valid sponsors? The organizers bring in musicians, radio hosts and cultural journalists from Haiti, Europe, some cities in the United States and Canada. They are accommodated and fed at the hotel, at the expense of the leaders of the cultural event. It's expensive. From a reliable source, we learn that two of the Haitian Music Awards ceremony organizers were reported by a competitor to the US Revenue Tax Office (IRS) for tax evasion. Yet whistleblowers also operate illegally in the music circuit. The game becomes brutal in Florida. Under the umbrella of the confraternity, we want them to get along, since they say they all work for the advancement and well-being of Haitian culture.